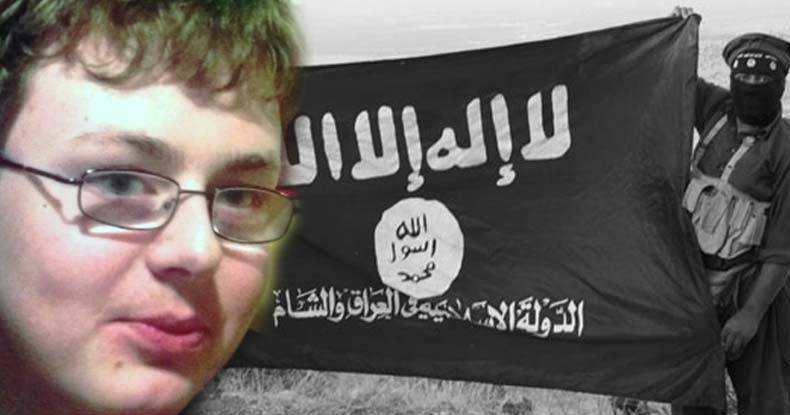 Immoral Patsy - How the FBI Groomed Mentally Disabled Teen With a 51 IQ into an "ISIS Terrorist"
It isn’t clear what use ISIS or the Pakistani Taliban would have for an 18-year-old American student with an estimated IQ of 51, is marginally verbal, and has little ability to perform routine tasks like tying his shoelaces. Peyton Pruitt, described by family and school officials as a developmentally stunted child, displays little understanding of terrorism and has no skills a terrorist group would covet. However, he is able to participate in online chats, which made him an irresistible target for FBI agents trolling the web in search of patsies to cast in Homeland Security Theater productions. Although Pruitt is unable to use the bathroom without assistance, the FBI and the St. Clair, Alabama Sheriff’s Office are pretending that he was part of a plot to provide “material assistance to terrorism” on the basis of online conversations with FBI agents posing as recruiters for ISIS and the Taliban. He remains incarcerated in the St. Clair County Jail on $1 million bond. Following an evidentiary hearing on December 22, Judge Alan Furr refused to reduce the bond and referred the case to a grand jury. In what might be an indication of the case, the FBI, rather than seeking charges under a federal statute, is assisting the effort to prosecute Pruitt under an Alabama state anti-terrorism statute. Anthony Pruitt, Peyton’s father, told the judge that he had given his son a laptop computer for Christmas last year. The teenager had been part of a program for handicapped people at the E.H. Gentry Technical Center – a school for deaf and blind children — until last May, when his father withdrew him. It was during his time at Gentry that Peyton was lured into compromising internet conversations with FBI agents. The father didn’t know anything about that activity until his son’s arrest in November. As a younger child, Peyton was diagnosed with “Mental Retardation, Intellectual Disability, Pervasive Developmental Disorder, and Attention Deficit Disorder.” Educators have described him as an invalid who cannot distinguish between reality and fantasy. During the probable cause hearing, prosecutors argued that Pruit was reading bomb-making instructions in al Qaeda’s online magazine, Inspire, and communicating with people identified as overseas jihadis – by way of a messaging service called Wickr — about potential sites for an attack. Prosecutors insist that they were shown a considerable amount of information during a meeting with the regional FBI director, but that supposed evidence was not presented during the pre-trial hearing. In cross-examining defense witness Helen Waldrop, an employee at the Gentry Center, St. Clair County District Attorney Richard Minor insinuated, without directly claiming, that Peyton “could quote the Koran” and had accessed an encrypted website. Assuming those statements to be true, neither would constitutes actual evidence of a crime or criminal intent, and both could reflect efforts of FBI provocateurs to manipulate the suggestible young man into doing something that would fit the familiar Homeland Security Theater narrative. Disturbed by Monteilh’s efforts to promote violence and incite terrorism, several people who attended the mosque, working with CAIR, contacted the FBI. Rather than thanking them for their vigilance, the FBI targeted one of them – an Afghan refugee named Amadullah Sais Niazi – for retaliation, accusing him of lying about a distant relative in a naturalization application and threatening him with prison unless he, too, became an informant. Nearly every “terrorist plot” supposedly foiled by the FBI since 2002 has followed this script, or some variation on it. When our supposed protectors go to such lengths to entrap and prosecute mentally retarded teenagers, it’s difficult to believe we face an existential terrorist threat.